Tapas, little food samplers, are taking over our tables nowadays. It is a lot of fun to be able to create your own version of these small culinary delicacies. I personally enjoy this way of eating a lot, because it gives me an opportunity to try different local flavors on a variety of plates. It also enhances the chance to socialize with one another, without having to eat a full meal. 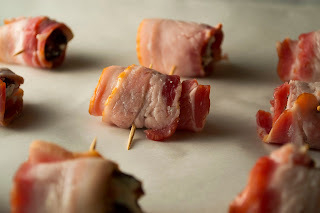 One particular tapas that really hit the spot was something I tried a few times, without ever being disappointed: Stuffed dates wrapped in bacon. 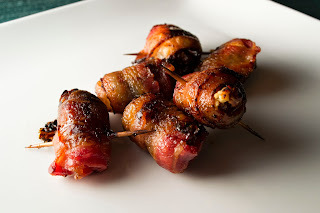 It is true that bacon can make just about anything taste good. The combination of the savory bacon, smooth creaminess of the goat cheese, and the sweetness of a date are a true winning combination. These dates are SO simple to make, and they are totally delicious! I love them because it's easy to make lots for social gatherings, and they can be assembled ahead of time. To start with, heat the oven to 400 degrees. While the oven is heating, start stuffing your dates. Slice open the top of each date, and stuff it with 1-2 teaspoons of your favorite goat cheese. Then take a half of a strip of bacon. Wrap the half strip of bacon around the date, and secure it with a toothpick. Arrange all of the dates on a parchment paper lined backing baking sheet. Bake the dates for about 10 minutes at 400 degrees, then turn them over to brown the other side. Bake them for about 5 more minutes. At this point the dates are ready to eat, but I prefer them a little more golden brown. So, what I like to do is drizzle them very lightly with a little maple syrup, then turn the broiler on for a few minutes. Keep a REALLY close eye on them, as they can become overdone quickly. When they reach your desired golden brown color, remove from the oven, and serve right away. They are also tasty at room temperature, but I prefer right out of the oven. They are wonderful with a glass of your favorite red wine. Enjoy!